In the fantasy world of Terra Mystica, different factions race towards transforming the landscape in their favor - all of which are driven to gain more power to fuel their expansion. In this turn-based strategy game, each of the 14 races are endowed with unique abilities that give them somewhat of an advantage over their competition. It is up to you what race to pick, where to initially establish your dwellings, and which path of expansion you'll take, in order reign control of the land and achieve the most growth in 6 turns. The interesting dilemma you’re in for is that you can either expand your territory by terra-forming the land in your favor (in order to build your structures), or alternatively take the risk of building your empire next to (or in proximity to) other races to promote trading and earn its unique benefits but will limit your options for further expansion. Either way, the goal is to achieve the most power by the end of the game. 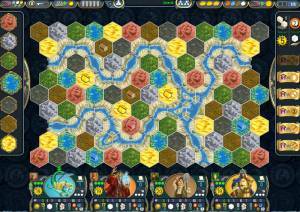 This game is an interesting digital adaptation of the well-known turn-based strategy board game “Terra Mystica” -refitted for the mobile platform by Digidiced to enable 2 to 5 online players to play the game, or for one to play with up to 4 AI opponents. - Interactive Tutorial to help new players get a start in this deep strategy game. - Enormous depth and interesting branching options with different repercussions in every situation. - Replayability: always changing and challenging game experience with new combinations. - Fully automated game (new game setup, plausible move limiting, and resource/score computation) making it a whole lot easier to play. - Includes subtle animations and well designed game tabs. No discussions open for Terra Mystica at the moment.